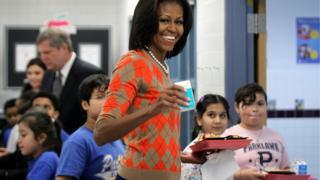 The Trump administration has loosened nutritional standards aimed at making US school lunches healthier that were championed by former first lady Michelle Obama. New Agriculture Secretary Sonny Perdue postponed reductions in sodium, relaxed requirements for whole grains and allowed sweetened flavoured milk back. One in five US children is obese, the US government says. More than 30m mostly poor children eat federally-funded school lunches. The 2010 Healthy, Hunger-Free Kids Act made federal grants for meals conditional on reductions in calories, sodium and trans fat content and increases in fruit, vegetables and whole grains. But speaking at a primary school in the state of Virginia, Mr Perdue said some aspects of the standards had "gone too far." Can you force children to eat healthily? "If kids aren't eating the food, and it's ending up in the trash, they aren't getting any nutrition, thus undermining the intent of the program," he said. The Agriculture Department said the change would give schools "greater flexibility". Health campaigners say they are most concerned by the failure to reduce sodium, which is linked to high blood pressure, heart attacks and strokes. The sodium limit for a high school lunch is now about 1,400 mg, or three-quarters of the recommended daily maximum, the Center for Science in the Public Interest (CSPI) said. Mr Perdue's move delays plans to reduce that figure to 1,080 mg in this school year. "This will lock in very high levels of sodium in school lunches," said Margo Wootan from CSPI. The School Nutrition Association, which represents the industry that sells food to schools as well as cafeteria workers, had lobbied to weaken nutritional standards, particularly those on sodium content. A Harvard university study found that vegetable consumption per student increased 16% from 2011 to 2012, when the healthy eating regulations went into effect. But students continued to discard 40% of their fruit despite the new regulations. Can healthy eating be forced on children?